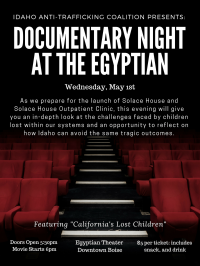 As we prepare for the launch of Solace House and Solace House Outpatient Clinic, we invite you to join the Idaho Anti-Trafficking Coalition May 1st at the Egyptian Theater in Downtown Boise for a Documentary Viewing. This evening will give you an in-depth look at the challenges faced by children lost within our systems and an opportunity to reflect on how Idaho can avoid the same tragic outcomes. 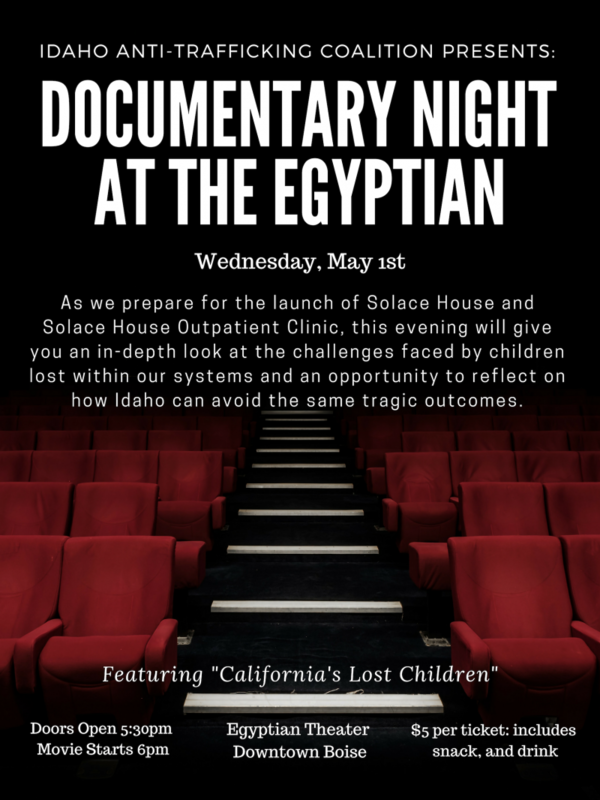 Through this documentary, Idaho is presented with a unique opportunity to learn from the failed systems, to identify gaps and barriers and collectively work to avoid the same tragic outcomes for children within Idaho's systems. We will be featuring "California’s Forgotten Children". This movie is a feature documentary and multi-platform project to research, gather, and share triumphant stories of survivors creating a new life after commercial sexual exploitation. Tickets will be $5 at the door and include entrance to the movie, one drink (water, pop, ect), and one snack (popcorn, candy). Additional drinks and snacks will be available for purchase for $1 each. Trigger Warning: Documentary contain descriptions of violence, sexual abuse, trauma, and trafficking. Parent's Note: Language used and subject matter may not be appropriate for children. We are advising parents not to bring children under the age of 16 to the event.